Tomorrow Corporation : Coming Soon to the Nintendo Switch! Coming Soon to the Nintendo Switch! STEP ASIDE! The door to the Tomorrow Corporation vault is about to burst open… Locked away for literally decades, three multi-award winning games will once again be available for a new generation to enjoy. Re-discover 2D BOY’s beautiful and surprising World of Goo! Re-ignite the dangerous and uplifting adventure in Little Inferno! Re-engineer your corporate ascent in Human Resource Machine! And for the first time ever, all three games will come bundled with their full original soundtracks. Tomorrow Corporation’s intrepid interns have created a new Soundtrack Mode, where players can explore Kyle Gabler’s wonderfully bizarre music in this special mode, available only on Nintendo Switch. We here at Tomorrow Corporation are some of Nintendo’s biggest fans, so we’re excited to be part of this new adventure alongside players at home, on the road, on the train, on the roof, or wherever it is kids go these days! Really great to see top-tier indie devs on the Switch from day 1. Me too! This is awesome. Fantastic news! I’ll be very glad to have them all to carry around with me in glorious HD! Then we are 30% of launch day! Great! I will buy Little Inferno at the first day! This is very cool. Kinda wish it was a physical release, but I’ll still grab these day 1. If there’s enough interest, we’ll look into it. We mostly stick to digital these days, so it’s been off the radar. Totally understand. If it ever happens, I’m totally a sucker and would double, maybe triple, dip. I’d love to see them in a retail pack. I will pay for them again if that’s the case. Hope you can find a publisher (Nintendo, Rising Star, etc) to see it happens. The amount I’d pay for a nice collector’s bundle that came with the soundtracks on CD or even just a physical manual would probably be higher than I’m willing to admit. Will there be any cross buy deal for people that already own the games on Wii U? We’re looking into it, but aren’t sure if it’s technically possible. 2 of my favorite games! Little Inferno was weirdly interesting too. Woohoo! This is fantastic. Will World of Goo have updated HD graphics? please say yes!! As a proud owner of all of these titles on both Wii and WiiU, I can’t wait for that double dip on the Switch. Oh yeah, just today I dreamt about being able to take my Little Inferno Entertainment Fireplace with me. I’m so going to get that thing one more time. Any info on pricing yet? With the list of launch titles getting more and more amazing, I need to start to plan my budget. We don’t know about price just yet, but players should be able to get all three of these games for less than the price of some of the other launch titles. Yess!! Thank you guys! You are awesome! will world of goo have multiplayer? How much will each of these cost? Any possible chance for Henry Hatsworth to ever make it to switch, or even, gasp, a sequel? I’d love to, but the IP is not mine, I’m afraid. Think we could redirect all queries to the fine folks at EA? How would World of Goo work in docked mode? I assume in tablet/portable mode it’ll be using the touch screen, but in docked mode I don’t think the switch can do a pointer type input as with the Wii due to the lack of an IR sensor bar, or does it? Are you working on any new games? Yes! Just not in time for the Switch launch. Will it be available for the EU folks? I’m … uh …. asking for a friend. I’ve wanted World of Goo for a while, squee, day 1! The other two are so very very good, and I’ll probably double dip on those in a moment of weakness (day 2, I’m guessing, I’m very weak). I have your games on my wii u, steam, and my android phone. I can’t wait to add them to the switch when I get it. I really loved little inferno and human resource machine. I would buy an expansion or a sequel to both in a heart beat. I can’t wait to see what else comes from Tomorrow Corporation! I wouldn’t even be mad if you added extra content or Easter eggs to the switch version. I just love your art style and stories. I’m interested in the control scheme setup in docked mode as well for World of Goo. Could you please clarify whether or not there’s going to be IR pointing on the Switch? 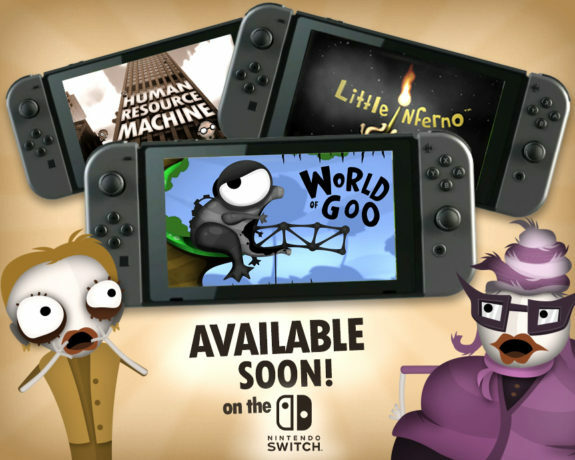 All 3 of our titles will work in all 3 of the Switch’s modes, so you will be able to play World of Goo on your television! And yes, we’re planning on releasing all 3 games in NA and the EU simultaneously. Gyro aiming in docked mode, perhaps? Seems kind of vague answer. Will the WORLD OF GOO be able to use motion control in one form or other? Because its Wii version is the absolute best version and I would die happy knowing that the motion control would be preserved in Switch version. Players will be able to use the left or right joy-con as a pointer or the touchscreen to play all three games. Aaaaand gyro-aiming it is, ok.
Best regards, I hope to hear about a new game of yours as soon as possible. Care to detail how World of Goo, Little Inferno and HRM will work on both TV Mode and Tabletop Mode? Any chance that there will be any kind of expansion for HRM? We use it as part of our classroom instruction. It would be absolutely amazing if we could create our own puzzles (and appropriate test cases) for our students to use. And as long as I’m making requests, I’d also love it if addition were allowed with characters. You can make ‘a’ 1 (or leave it at 97 – I don’t care at all). Rotation cyphers, here we come! We had a lot of discussion about allowing letters to have usable numeric values, but decided to keep it simple for beginners. Next time! What about creating other puzzles through some sort of modding? Is there a reasonable way to do this? wow! Cant wait 4 little inferno! I just got my Switch and was looking forward to replaying one of the best indie games ever! But I can’t find world of goo on the eshop. Was it delayed? I know the games and its bundle have been delayed, but is there a concrete release date? When is this coming to the switch? I was hoping for launch day but when I checked the eshop it wasn’t there. Hope it comes out soon! When will these come out?